Wow - you don't hang about! I was going to offer to cut the good upper joint from my scrap one for you to disasemble and rebuild into yours! Thanks for the offer bob-in-dav. Got it now all back together with the old universal joint revived. Most of the 24 pins from the bad cup had developed a flat point and were rusty. Refitted all cups spreading the bad pins equally among the good: 1 bad followed by 3 good and so on. Got each of the cups secured with M5 screws, special washers and Loctite so easier to renew the joint once it goes stiff next time. Loose needles can be bought new if you want to renew them next time. I lost one out of 96 pins. Cut a piece off a 1.5 mm drill bit to replace the missing pin. Yes, pins can be bought but at a price and not at right length. These pins measure 1.5 x 6.5 mm. You can buy 50 pins measuring 1.5 x 15.8 mm for £11.39. Then you have to cut them to right size and calibrate their length. A lot of work but worth while doing if there is no other option. Better in my humble opinion just to replace the UJ. Only £8.99. Agreed, cutting needles to length would be a PITA. If you have bought a new UJ - why did you bother rebuilding the old one? Too prove it can be done. The chance is, the rebuilt UJ may outlast my time. Have now added additional protection. Tie wrapped part of an old household glove to shield the UJ from the weather. The lower steering column UJ is very exposted just behind the radiator. The final photo is for pinger. 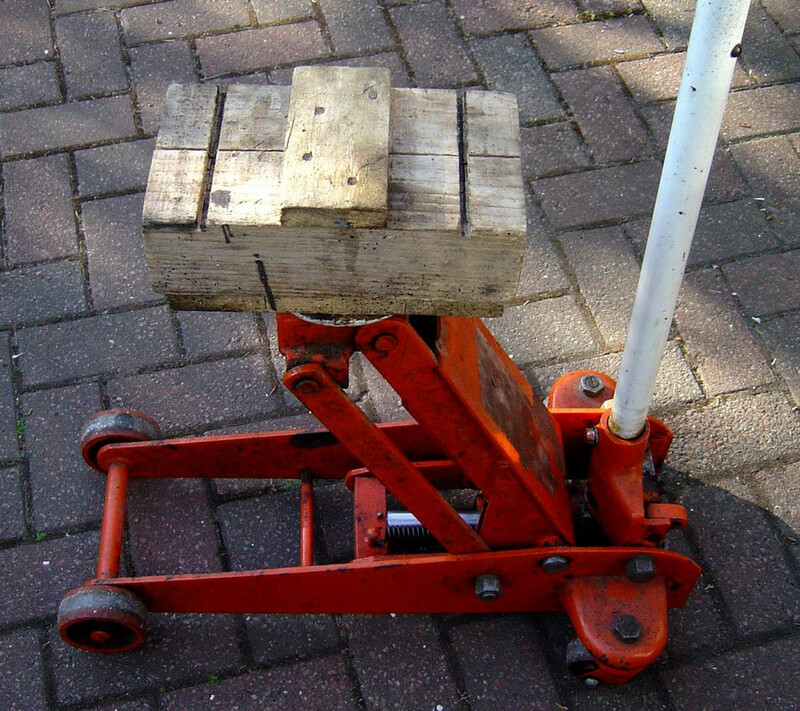 The wooden contraption is for lifting the front axle. It fits under the front axle cross member. My trolley jack blew its ram seal many years ago. Jack Sealey wanted £100 for a new seal. I turned a new ram seal out of nylon 66. Only had to make the lip of the seal deeper to compensate for nylon being a lot stiffer material than rubber. Works perfectly now. Tested it to 3 Tonnes. Last edited by tolsen; 03-05-2018 at 09:37 PM. Have spent most of this sunny and warm Sunday driving around on random in my headturning Cabrio with roof down. Partcularly fast smooth gear changes and now light self centreing steering make for a fantastic driving experience. Removed steering rack damper but can't feel any difference. The universal joints fitted in my steering column measure 15 x 39.5 mm. 15 mm is diameter of cup. 39.5 mm is distance from cup to cup. The one I have ordered is stated to measure 15 x 39 mm. Damn fine work there Tolsen. I'm guessing cups have inboard clips. Did you press or hammer them out? I'm going to have to buy a steering column just to do this for the website. Let me know how you get on with the H2 UJ. 15x39.5 seems like a very odd size considering how many cars including Mercs use 15x40. Last edited by evilution; 30-05-2016 at 02:00 AM. No locking clips on these universal joints. Steering column is made on the cheap. The yokes are peened over at four points for each cup to lock them in place. I used a special chisel to "peen back" each of these points. Pressed out the cups in a hydraulic press. Special skills and brains are required for this job something very few posses. There is insufficient lateral play to press the cups out fully. Press each pair out as far as possible, then drop suitably sized ball bearing balls into the cup and press out further until cup is free. This is the standard way but not easily explained. I do not recommend cleaning up and refitting existing universal joints. It's seals and pins will be worn so not worth it. Fitting new universal joint is a lot easier since the bearing needles (pins) will stay in place. On old joints the pins will easily come loose when fitting cups and ruin your day. Does the above UJ 'bend' 90 degrees? Below, as it attaches to the rack, is the positive engagement by one or more flats on the shaft? How many flats - two? Lower UJ is bent approx 30 degrees. Upper UJ same. Pinion shaft connection is rectangular in section with one short side rounded. Cam on cam bolt presses against the flat short side. This makes for a very secure connection. Cam bolt and nut are recommended to be renewed but I do not bother since I will easily become aware that something is wrong if steering develops an excessive play.